Jazz Partout from Helsinki, Finland plays Gypsy jazz with musette flavors in the spirit of Django Reinhardt and Gus Viseur – with everlasting energy and tasty style. Jazz Partout: Mika Huusari (accordion), Eerik Siikasaari (bass), Petri Krzywacki (guitar) and Kimmo Iltanen (guitar). 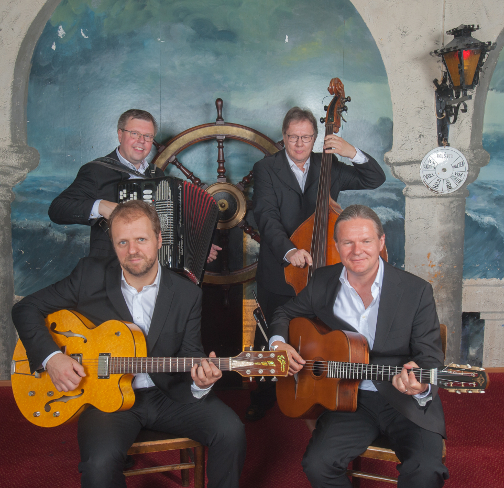 Jazz Partout's music is an irresistible blend of Gypsy jazz, French musette waltzes and classic chansons. It's a mix that combines the best qualities of three different cultures: American swing, French elegance and expressive emotionality of Sinti music. The sonic palette of accordion, two guitars and double bass immediately takes you to Paris. The repertoire consists of tunes made famous by Django Reinhardt, Gus Viseur and Edith Piaf, not to forget the contemporary masters of Gypsy jazz like Stochelo Rosenberg and Biréli Lagrène, or the never-ending goldmine of American jazz standards. Bref, un jazz gitano parisien qui n'oublie pas non plus la grande chanson française (Francis Couvreux, Etudes Tziganes). Jazz Partout's members are experienced professionals. Accordionist Mika Huusari has five times won the annual jazz critics poll in the magazine Jazzrytmit, Petri Krzywacki is a sought after session player, arranger and band leader, Kimmo Iltanen has a university degree in Musicology and he specializes in French Gypsy style jazz playing in the Django Reinhardt tradition, and bassist Eerik Siikasaari has toured all over the world with top class ensembles.